The two evening performances Tuesday, March 19 and Wednesday, March 20 at 7 p.m. require tickets. We have a limited seating capacity and tickets are available on a first come, first served basis. Each family can request a maximum of six tickets. To reserve your tickets, go to the Ticket Order Form and reserve your tickets by Wednesday, March 13. It's less than a month to go before the premiere of "Annie Kids." Rehearsals continue every day. They're smiling now but it's a hard knock life for sure. Choreography rehearsals are underway! With just six weeks before the show, Annie met Sandy! Mr. Forney reviews with cast and crew what will be covered in Friday's rehearsal. Under the direction of Art Teacher Susan Kuntz, students are working on set decorations. Students help on every aspect of the musical from set design to the final curtain call. Props, backdrops, singing and dancing, the students are involved in all parts of the production. The backstage crew will work with lights, sets and props. Thanks to some wonderful donations, the props and sets will help set the time period for the show. Crew members plan what propers will go where during the show. Ensemble Building: By its nature, theatre requires the creative input of all its participants. Students work together to rehearse, construct, perform and promote their show. Self Confidence: Young performers discover how to take creative and emotional risks and learn to trust their abilities throughout the rehearsal and performance process. Reading & Literacy Skills: From constantly reading their scripts, immersing themselves in the story, memorizing their lines, and taking notes at rehearsal, putting on a show is an active and engaging approach to improving literacy at an individualized pace. Self-Discipline: Students learn the importance of being reliable and trustworthy members of an ensemble. Through learning their choreography and lines and actively participating throughout the process, students acquire valuable self-discipline techniques. Critical Thinking & Problem Solving Skills: Due to the show’s collaborative nature, all students become valuable in troubleshooting elements of their production. Working out the nuances of a character or a tricky scene change allows participants an opportunity to creatively tackle challenges. Engaged Imaginations: Theatre is most dynamic when the imaginations of its creators are fully engaged. Throughout the process, students create another world through acting, dance, music and design. Creative and Emotional Outlet: Having a creative outlet on a regular basis is not only part of a well rounded education, but also vital to a child’s well being and emotional health. Producing a show provides growth opportunities for all varieties of learners: kinesthetic learners explore dance and their bodies in physical space, linguistic learners dive into the spoken and written word, and spatial learners devise inventive sets and the arrangement of objects in space. Enhanced Empathy: Young performers explore the lives of others through character work and exploration of story. Providing participants with first-hand perspective aids in the development of well-rounded students and citizens. 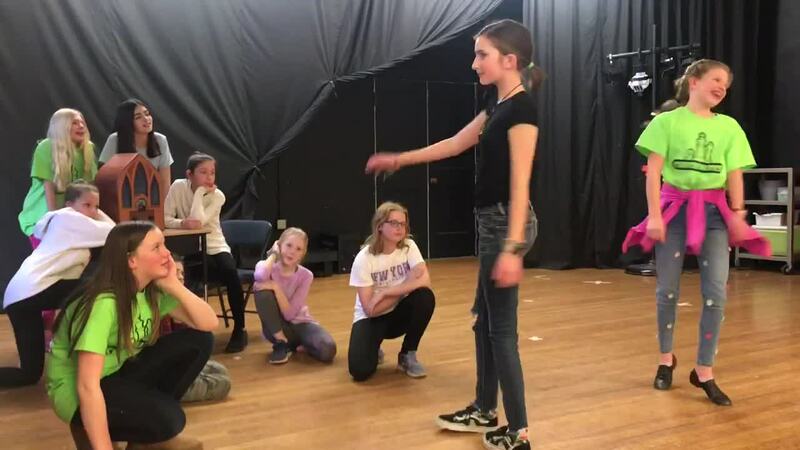 Cross-Curricular Opportunities: The themes and worlds of a musical provide a rich springboard for cross-curricular connections. As you can see, our students are gaining valuable life skills through this production. We’re looking forward to jumping into rehearsals and hope you will join us on opening night! Thanks for your continued support in providing our students with this educational experience. Wednesday, Nov. 28 - Audition Preparation Meeting #1 -11:40 a.m.-12:20 p.m.
Thursday, Nov. 29 - Parent Meeting - 6:00 p.m.
Click on the policy name below to display the information. Auditions are a very important part of the process as we prepare for our show. The Audition Committee is made up of a panel of teachers who will give you a score based on your performance. You will want to come prepared to the audition with a short singing solo and a small part of the script prepared. We will score you based on singing, spoken diction, stage presence, concentration and dance/movement. You can find an overview of the process, the needed materials and audition tips below. Auditions will be held during lunch and after school Dec. 10-14. There will be specific days for each character. Students should attend for their character day. Students should audition for one part, and let the audition committee know any additional parts in which you are interested. By accepting the part, you agree to commit to the show's rehearsal schedule and communicate responsibly about potential absences. Rehearsals in January and February are Monday-Friday and will generally end at 4:30. Rehearsals in March will tend to go until 5:00 or 5:30. A detailed Rehearsal Calendar will be shared when it is finalized. If we need to adjust the schedule, we will let you know. Go to “select a show” menu and scroll down to select our show. Be sure to select the ‘KIDS’ version, because the parts are different. Click on the plus sign in the upper right corner. We will use Google Classroom to post important information about the musical - including the rehearsal tracks for students to practice singing with at home. BE PREPARED: Memorize the lyrics and melody of your song. Memorize the script so you can concentrate on acting and movement. SMILE: The audition committee wants you to do a good job. Try to relax and enjoy the process! BE FLEXIBLE: Do your best at whatever you are asked to do, even if you are reading for a role that you find challenging. TRUST US: We will assign each student to the most appropriate role. BE POSITIVE: If you don’t get the part you auditioned for, try to be happy for the other students who did get a part. Sometimes it is just another person’s “time to shine”. Remember, whether it be through chorus, dancing, or stage crew, every student will have a role in the success of the show. A musical is a big undertaking and we will need help from many parents and teachers. We will need help in areas listed below. We need one parent to find/borrow all of the props required for the show. To allow students plenty of time to practice with the props, we need them far in advance. All props should be collected and given to Mr. Forney by rehearsal on the first “blocking” rehearsal. We will provide you with a list of props we need. Mrs. Duell will be in charge of costumes and is looking for a few parents to help with this. Mrs. Duell will give all of the costume requirements to parents, but will need a couple costumes to be sewn. If you are a talented seamstress, please contact Mrs. Duell. Mrs. Duell will send out a letter with costume requirements for each character and a due date. Mrs. Kuntz always does an amazing job with the set and design of the musical. If you are interested in helping, please contact Mrs. Kuntz and she will let you know if she needs help. I am looking for one parent to be in charge of designing the program, and organizing a group of students to pass it out at the shows. This program must follow certain guidelines from Disney and I have a sample that can be used as a guide. The program is due two weeks before the show so I can proof it and make changes if needed. We will print the program at the school. I’m looking for one parent to send a photo and short article about our show to our Community Relations Director Traci Hale at hale.traci@oakwoodschools.org. Ms. Hale will submit the article(s) to the Oakwood Register. Two different articles would be nice. General Announcement of our show due in February. Announce the performance Dates and times and how to get tickets. We need one parent to be in charge of making the cast photo and having all the students sign the photo. These will be passed out at the end of the production as a keepsake for the students. We will also make a large copy of the cast photo to display in the hall. We need a team of parents to be in charge of tickets for our two evening shows. This includes communicating to families about how to order tickets, designing tickets, printing tickets, and working the “ticket booth” for the night of the show. I’m looking for four parents to do this so you are able to still see the show yourself. We are looking for a few parents to organize the food for our cast party at the end of our show. The party will be held after school on the day after our last show, after school. The music director is in charge of all music throughout the show. The choreographer is in charge of all the dance in the show. The stage manager oversees the management of all things happening backstage both during rehearsals and the show. Teaches students how to “call the show,” “stay on book” during the show. Oversees and directs all technical aspects of the show like lights, sound and video. Assists the adult stage manager with the logistics of the production. Is in charge of all backstage students. Is responsible for calling the sow and giving cues. Will be posted in hallway stage left. VERY organized, VERY responsible, calm, patient, student with leadership skills who prefers to be behind the scenes. Will need to work well with adults and be able to problem solve in the moment. MUST understand the story and flow of the show. Assists the student stage manager with calling the show and giving cues. Will manage stage right. Works with music director to learn and master all music and sound cues. Controls the computer and music through all rehearsals and shows. VERY responsible, tech savvy student who can pay very close attention to detail, timing, etc. Will need to work well with adults and be able to problem solve in the moment. MUST understand the story and flow of the show. Works with music and technical director to learn and master all light cues. Will manage light board/ipad throughout most rehearsals and shows. Will work with technical and music directors to ensure all microphones have FRESH batteries and are organized and ready to go for each rehearsal and show. Responsible student who can lend organization to this task. Will need to take the initiative to understand the technology and how to replace the batteries. No cutting corners. Will work with stage manager to ensure that all costumes are accounted for and in the right location at the beginning, during and end of show. Responsible student who can lend organizational skills to this task. Will need to take initiative to make repairs or get help with repairs. Sewing/craft knowledge helpful. Will work with stage manager to ensure that all PROPS are accounted for and in the right location at the beginning, during and end of show. Responsible student who can lend organizational skills to this task. Will need to take initiative to make repairs or get help with repairs. Artistic skills helpful. Will work with stage manager to ensure that all scenery is in place and ready to go at the start and end of each show. Will be responsible for learning, adjusting, and mastering the flow of large scenery movement during scene changes. Responsible students who are looking to be physically active while backstage. Must have working knowledge of story and flow of show. Can behave maturely and under control while working quickly and quietly. Can problem solve in the moment. Will work with choreographers to learn and master all parts of dance routines so they can lead during rehearsal and show. Skilled and experienced dancers who are patient, like to teach others and perform. Will work with Stage Manager (adult) to ensure the house is ready for all rehearsals and shows. Organizes space and chairs. Will need to communicate with custodians. Responsible student who doesn’t mind hard work and moving chairs, etc. Will assist Mrs. Kuntz with the creation of certain set and scenery pieces. Artistic, creative students who will follow directions and be responsible with materials and supplies.